Having visited the Bedroom of the Empress Maria Aleksandrovna, one must return to the glass room, it has a transparent door, leading to the Glass Loggia or Cameron Gallery. This is a terrace, sheltered on the north and on the west by two of the palace walls. Its roof is supported by columns of white plaster. The southern side overlooks the Private Garden, and from the east the terrace nearly joins the Hanging Garden. Both walls of the terrace are painted in a light blue shade; the floor is paved with marble flags. The Glass Loggia was constructed by Cameron at the same time as the rooms of that part of the palace, forming the private chambers of the Empress. He formed the plan of building a garden on vaults with a sloping descent into the park, having a colonnade, a cold bath-house, and a set of Agate rooms. This plan was fulfilled during the years 1779-1792. In the last years of Catherine's reign Cameron also began the building of a church near the Agate Rooms, but had not the time to finish it during the life of the Empress. It was pulled down afterwards. In the time of Catherine, near the longitudinal wall of the Glass Loggia was placed a green Morocco divan with a table in front of it. Here in the mornings the Empress liked to occupy herself with business. The entire Hanging Garden, as well as the garden in the corner, formed by the lower story of the colonnade and the cold bath-house, were full of sweet-scented flowers. During quiet warm evenings the Empress liked to rest after a walk on the "terrace", as the garden between the glass Loggia and the Agate rooms was called. The Countess Golovina mentions in her journal the extraordinary impression, produced by the Empress' court with the fairy tale conditions of those times, while in the Western Europe the terrible French Revolution bad broken out. According to the testimony of her secretary, Gribovski, the Empress Catherine, when in Tsarskoe Selo, regulated her day in the following manner: She rose about 8 o'clock, in the morning and was occupied with letters in the study or on the terrace until 9 o'clock, when she passed into the bed-chamber, where she listened to the reports till 12 o'clock. During that time the Empress usually received, dressed in a white gros-de-Tours morning-gown, having on her head a white batiste cap, pinned a little to the left side; she held in her hands a magnifying-glass, and in her old age began to wear spectacles, which she much disliked. "We have in the permanent service of the State weakened our sight, and are now obliged to use spectacles", she once said to Gribovski. After 12 o'clock the Empress dressed, and at about 1 o'clock "had dinner", which did not last more, than an hour. After dinner the Empress retired to her rooms, sometimes she slept, but usually she walked, or listened (twice a week) to the foreign correspondence, modeling mean-while paper forms from cameos. About 6 o'clock courtiers assembled "for the evening party" in the state rooms or in the theatre. At 10 o'clock the Empress withdrew to her private rooms, and about 11 she was already in bed. On weekdays gentlemen attended court in coats, and on holidays, until the evening, the officers wore uniforms, and the civilians French attire. On particularly solemn days, on returning from Liturgy, the Empress received holiday congratulations (usually in the Picture Hall), and stretched out her hand to be kissed. On these days gala dinners were held, during which "the drinking cup was served to Her Majesty by the Court Marshal'. Often in the evenings Her Majesty "with the maids of honour and the cavaliers" attended the theatre to see "the comedies, performed by actors of a private theatre". "Nothing could be more majestic, imposing, and at the same time indulgent, than Ekaterina", says the Countess Golovina in her diary, "as soon as she appeared, all fear vanished, respectful devotion". People came on a visit to Tsarskoe Selo only by Her Majesty's special invitation, and on Sundays many of the highest statesmen attended mass. Here also took place the change of the adjutant generals for the weekly attendance. He, who had finished his service, bent the knee before the Empress and passed to her the staff, which she handed over to the new general on duty. The colonnade was built by Cameron on the spot of the pavilion for the "Jeu de paume", which already existed in the time of the Empress Elizabeth. The second story of the colonnade is placed at the same level as the "Hanging" garden. It is a narrow hall, with windows from all sides, surrounded by a covered gallery, with a row of white plaster columns. The first story of the colonnade is covered with flag stones and consists of a corridor with several ,small rooms on both sides. During the reign of Catherine II it was occupied by the 'maids of honour. 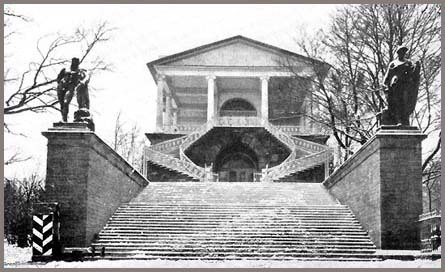 A monumental flight of stairs, ornamented with statues of Hercules and Flora, leads from the park to the second story; they were molded by Moyalov in 1785-1786 from a drawing of Professor Gordeiev. Between the columns, of the colonnade stand bronze busts, copies from antiques, molded by the order of the Empress Catherine II in the Academy of Fine Arts in St. Petersburg; among them you see the bust of Fox, the. chief of the opposition in the English parlament of that time. 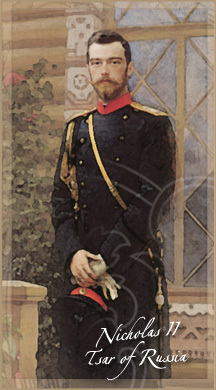 "By his eloquence, he saved England from a war with Russia", said the Empress, "I cannot express otherwise my gratitude to him". She ordered the bust to be placed between those of Demosthenes and Cicero. "Plitt is jealous", once said the Empress, showing the colonnade to her guests.